You will be given a reference e-book to read which has 880 pages And the test will be based on that e-book , you can take final test within 1 year of purchase. What is Red Hat Linux 7.2? Becoming a Red Hat Linux 7.2 expert is no longer that difficult at present because Brainmeasures which continues to satisfy the public with its comprehensive online certification courses now include a Red Hat Linux 7.2 certification course among its many offers. What makes the Red Hat Linux 7.2 course from Brainmeasures amazing is the fact that it offers the most detailed information about the operating system. This certification course makes it possible for you to receive a kind of Red Hat Linux 7.2 training which is comprehensive enough to let you understand even the most complex aspects about the operating system, its major components and elements, how it works, a guide to its installation and its most useful features. 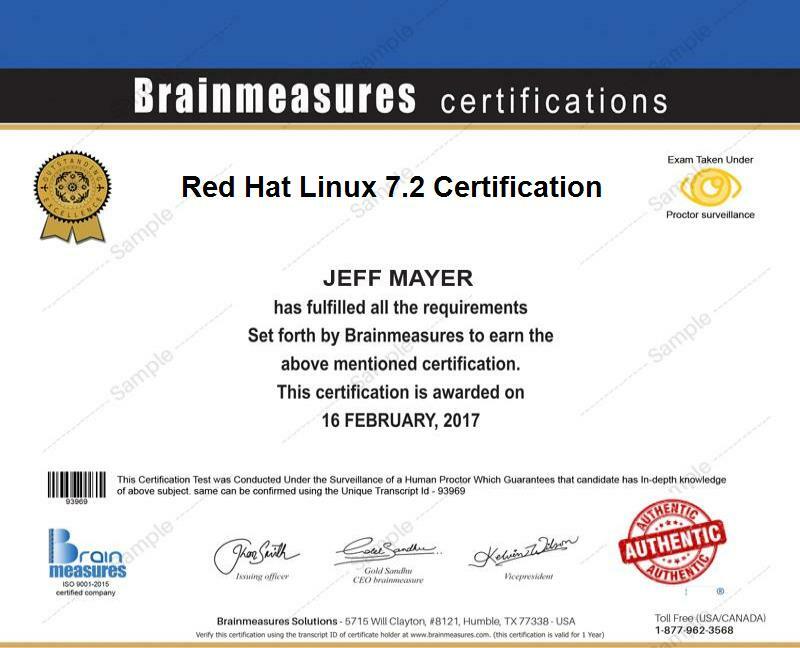 After you receive your Red Hat Linux 7.2 certificate from Brainmeasures, you can start showing the entire industry that you have the highest level of skills and knowledge in navigating the operating system. How to choose the best installation method and computer hardware? How to reclaim disk space from emerging partitions? How to troubleshoot the whole installation process? The Red Hat Linux 7.2 certification program offered by Brainmeasures is developed in such a way that it benefits numerous individuals and professionals. You can expect it to work more effectively for system administrators, network administrators, IT professionals and any other individuals and professionals who wish to learn more about the Red Hat Linux and increase their proficiency and skills in using this system. You can also expect to start receiving a higher level of salary after you successfully complete your Red Hat Linux 7.2 certification course. You may find your Red Hat Linux 7.2 certification useful in getting the position of a Red Hat Linux administrator which usually offers an average annual salary of $78,000. You can also work as a Red Hat Linux engineer which gives you the opportunity to receive around $85,000 to $122,000 annually.